Dr. Roy Varghese of Hyden was a stroke patient at Mary Breckinridge ARH Hospital, a member of the UK HealthCare/Norton Healthcare Stroke Care Network. 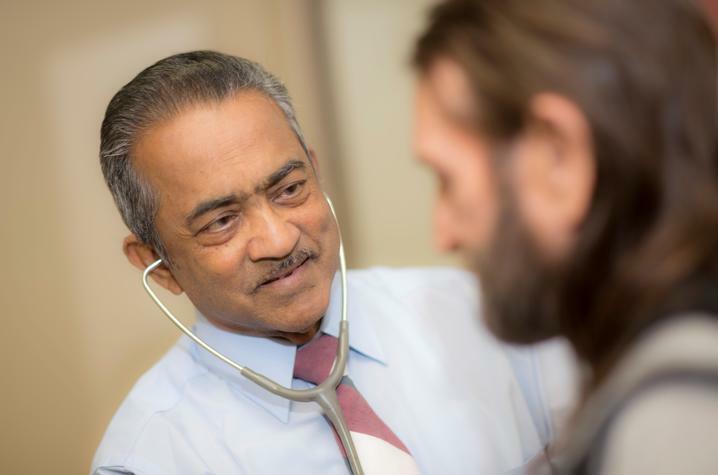 LEXINGTON, Ky. (Oct. 29, 2018) ̶ Dr. Roy Varghese, a board-certified internal medicine physician, is a local celebrity of sorts in Hyden, Kentucky, where he has practiced at Mary Breckinridge ARH Hospital for more than 30 years. Varghese, who still makes house calls, is beloved for his hard work, dedication and devotion to patients and families in Eastern Kentucky. "His work has touched just about every family around here," said Mallie S. Noble, Mary Breckinridge’s chief executive officer. "He's treated five generations of my family alone." But last year, Varghese became the patient when he had a stroke. Around 7 a.m. on Sept. 19, 2017, while walking on his treadmill at his home, he lost his balance, began having weakness on his right side and fell off the treadmill, he said. Fortunately, Varghese, who lives just three blocks from the hospital and next door to an EMT station, was still alert and conscious. In fact, although he asked his niece to call 911, he walked to the ambulance parked in his driveway and had them take him to Mary Breckinridge ARH Hospital's Emergency Room. He also asked his niece to call the ER staff and alert them he was coming in with a sudden stroke on the right side of his body. When he arrived, the staff at Mary Breckinridge ARH, including House Supervisor Kermit Creech and Emergency Department Manager Brittany Maggard, was waiting for him at the door. "They were ready and knew immediately the protocol for the treatment of my stroke," Varghese said. As a member of the UK HealthCare/Norton Healthcare Stroke Care Network, Mary Breckinridge ARH Hospital was indeed very prepared. The network had helped to ensure that the 25-bed Critical Access Hospital, roughly two hours from Lexington, had all the resources in place to save Varghese's life. "The Stroke Care Network goes beyond helping our medical staff and emergency personnel recognize and respond appropriately and quickly to the signs of a stroke," Noble said. "They've helped us with outreach, so that even the smallest of our citizens know what to look for and how to react." Immediately after arriving at the hospital in Hyden, Dr. Ronan Murphy, the on-call physician at UK HealthCare's Comprehensive Stroke Center in Lexington, was contacted and provided on-the-spot consultation. As a result of quick action by the team at Mary Breckinridge ARH Emergency Department, within 13 minutes of his arrival, Varghese received a CT scan of his brain which was sent to UK for evaluation. Within 33 minutes, he was given the clot-busting drug tPA and within 50 minutes, he was in an ambulance on his way to London where he was flown to UK in Lexington for further evaluation. As word spread that Varghese was ill, staff gathered at Mary Breckinridge ARH Hospital, a part of Appalachian Regional Healthcare System, in a sort of vigil. Varghese remembers Noble and others gathered in the Emergency Room in Hyden. "We had prayer and then I was transported to UK,” he said. According to Dr. Michael Dobbs, UK HealthCare neurologist and director of the Stroke Care Network, its primary intent is to share the most current evidence in stroke treatment and prevention with hospitals and other health-related entities in smaller communities. Network members ̶ 33 in all covering Kentucky and some parts of West Virginia and Indiana ̶ swap success stories and discuss challenges in an attempt to improve quality of care close to home. They also have access to a wide variety of services and materials to support the growth of their stroke treatment programs, such as the CATS (Comprehensive Approach to Stroke) Lecture Series, a monthly teleconference featuring UK faculty and staff which provides continuing education credit for medical and nursing staff, EMS personnel, and other disciplines. Seeking medical help is critical to the outcome, according to Dobbs. "Time is essential when treating a stroke, and not just to save a life," Dobbs adds. "Stroke is a leading cause of disability in the U.S., so fast access to treatment not only saves lives, but also improves quality of life for survivors." For Varghese, quick action was key. "He indeed was found to have a small stroke, and it turned out that he had had a tiny older stroke as well that affected the vision part of his brain, but he had recovered well from that, with minimal effect on his vision overall," Murphy said. "Fortunately, he soon began to show steady improvement in the hospital, engaging in lively and intelligent conversation about his latest interest, the gut biome." In fact, Murphy says, when he followed up three months later in the telemedicine clinic, Varghese had only minor residual left side weakness and just a hint of vision problems on his right side. "He aced his cognitive examination, and it was clear to me from the testing, from my conversation with him in the hospital and later on the telemedicine screen that Dr. Varghese was an astonishingly sharp and quick-witted individual," Murphy said. But Dr. Murphy is quick to emphasize that Dr. Varghese didn't receive special VIP treatment, rather the rapid response, expertise and coordination that the Stroke Care Network provides to every patient. "I think Dr. Varghese’s case highlights some of the parts and the people that are the jewels in our Stroke Care Network, but the crowning moments are seeing every day how this all comes together to actually make a difference, one patient at a time."